Many have asked us about our newly presented coffee, the plants of which are cultivated at Palintang hamlet in Bandung, W. Java of Indonesia. What is the taste? Apparently many of those interested and coffee lovers in the country find it curious about the "traceability" of Palintang coffee. This coffee seems to appear from nowhere. You may not believe but some really do that the northern Bandung mountainous stretches were the most original locations in which the Dutch colonies during eighteenth century grew coffee plants in the country, and later the coffee of which excelled throughout the world. If it is really so then this Palintang java is among the most newly emerged coffees from the original Java (real Java Island) coffee. And yet what is the taste character? We had promised once the processing was over to disclose the character as we perceive it. We processed the coffee into three kinds of natural, honey and fully washed processes. 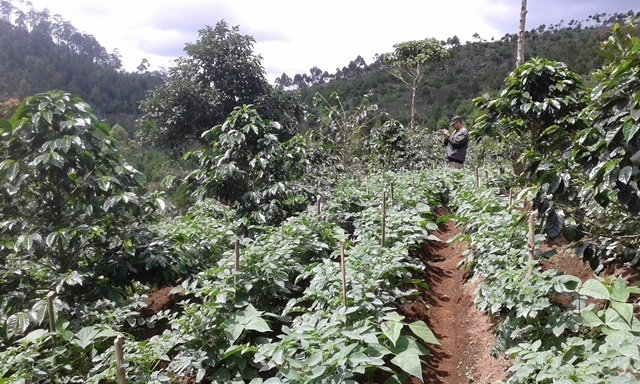 The natural has eventually much helped us to define the main, dominant character of the coffee. We sense the fragrance of caramelized banana yet as the coffee rests some time it turns into subtle jack fruit, two kinds of fruits the fragrance of with we rarely associate one with other. You may find also red coconut sap, vanilla, different nuts, plus fresh oranges or berries .. The honey process even smoothens the taste of the Palintang coffee as compared to natural processed, that almost retains “native” flavors of this coffee. Perhaps we have found, at least, the local traits of the coffee, if it is too far to mention its “terroir”. You may still however grasp the jack fruit, vanilla, delicious nuts along with coconut sugar in a subtler palate. Both natural and honey processed coffees originate from merely mature, red coffee cherries, as we specifically sort them as required, a new practice that we keep demanding to the farmer or workers to observe. The rest consist of red-yellow and yellow cherries that later are to process fully washed. After being partly de-pulped, the parchment coffee beans then be cleanly washed manually before being fermented for 25 hours. What are the taste of this full washed coffee after roasting? 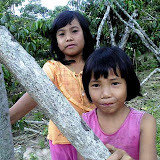 We find that the taste of caramelized jack fruit and banana almost nearly wiped out yet there appear vanilla and mostly tastes of different nuts apart from fresh, bright taste developed ..
Pak Maman also used water supply that the hamlet provides for the local villagers. 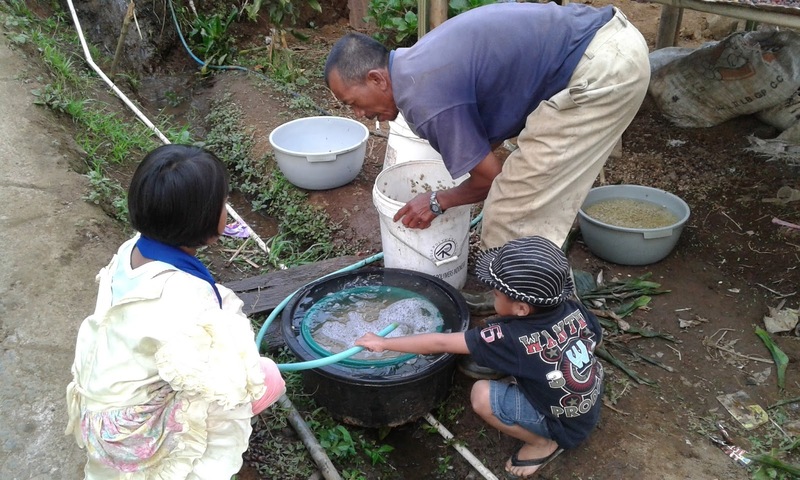 Such sweet water originates directly from nearby water spring in the mountain, with which Pak Maman thoroughly washed the parchment coffee. You may even drink the water as I do without any worry of having any digestive problem as it right away comes from adjacent mountainous areas,the course of which is separate from water used for local horticulture. 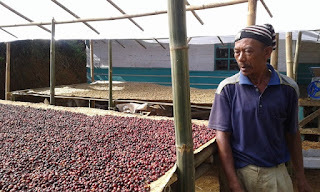 You may not wonder why the coffee also retain a clean cup, apart that we no longer dry the coffee on the floor but we raise the drying bed nearly one meter above the ground on a bamboo mat covered with plastic sheath to avoid the coffee from scorching sun during dry season in Indonesia .. The environment that sustains Palintang coffee apparently not very different from all coffee cultivated in the surrounding of Bandung areas. 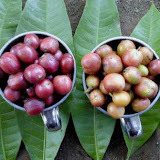 We find nearby other producers engender coffee beans with nearly similar character. Pak Maman’s plot of land reaches about 1,500 meter from sea level that render the coffee comparatively bright as compared most mild coffee from Indonesia. As the location is not that far from Bandung city, you then could take only about half an hour to reach Pak Maman’s smallholding area from busy Ujung Berung market in Bandung city on motorbike taxi. Welcome if you are really interested to visit the farm.